I think most of you know that I LOVE painting horses! So much, in fact, that I did two different painting tutorials as part of the Painting Pyramid series. One covered Appaloosa and the other Dapple Grey. 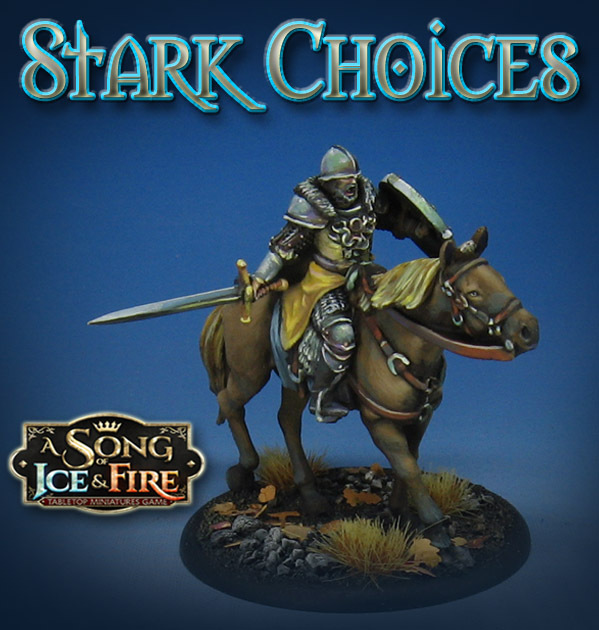 I love painting horses even more when they are sculpted this well, and the Stark Outriders from the Song of Ice and Fire miniatures game definitely are! With so many nicely sculpted muscles, I was able to do some very fun color shifts in the shadow areas. I am not sure if you can see it, but you might notice that the shadow colors are not merely a darker tan shade. In fact, they are green! Because there is such a predominance of blue, along with yellows, having that green in the shadow areas is not very noticeable, and registers as grey to the eye instead. This is not the only place where the green was used. I also placed in on every metal piece as well. These fun subtleties in shadow and mid tone areas are not very difficult to work out, ad adding them creates so much additional depth to the piece. As the Song of Ice and Fire miniatures are a slightly larger scale, this also means you have a bit more surface area to work on. I will be doing a number of Cavalry tutorial videos for the Patreon Page. While some will be for the Army Painter series, you will also be able to get access to some for the $5 pledge level as well! These would also cover specific breeds of horses, such as the two Painting Pyramid videos that are already available to the patrons... here's a link for you!